Now, like so many of my recipes, I sought to keep this salad as simple as I could while still packing in flavor. Watermelon doesn’t need a ton of help in that department since it’s so sweet. To balance it out, I paired it with peppery, bold arugula. Then, fresh mint and basil add a big more depth. 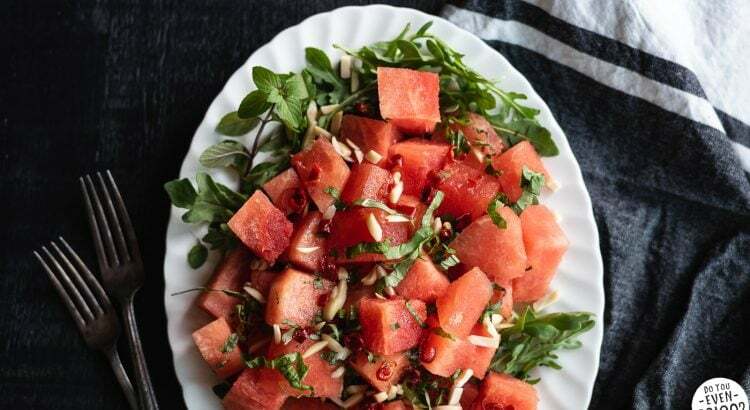 Seriously, this watermelon arugula salad makes a great combo. I initially got the idea from a Minnesota State Fair offering I read about a couple years ago. I wasn’t able to actually go to the state fair, but one day I found myself reading up on the food offerings. Yeah, that’s how I get my kicks. Anyway, watermelon and arugula stuck out to me as a great combo, so I jotted it down to eventually test out. Well, it took me a couple years, but here it is! Historically, arugula is not my favorite leafy green. Read anything about arugula, and you’ll see the descriptor “peppery”… And it’s true. Arugula certainly booms with spicy pepper. Because of that, I don’t often pick up arugula. 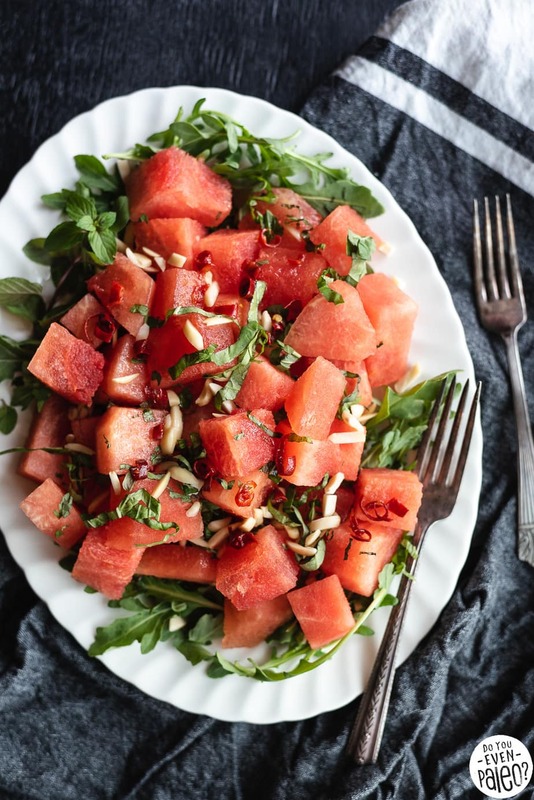 But it turns out watermelon and arugula make a great match. Actually, I’m sure fruit + arugula is a great combo no matter what. As you’ve noticed, I’ve been on a salad kick this spring/summer. I always find it easier to create veggie-licious recipes in the warm months rather than the winter. I’m sure I’m not alone there, but that’s maybe something I need to work on this winter! 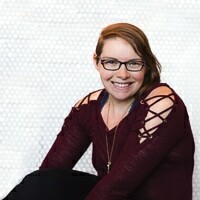 After all, I’m supposed to be giving YOU ideas! 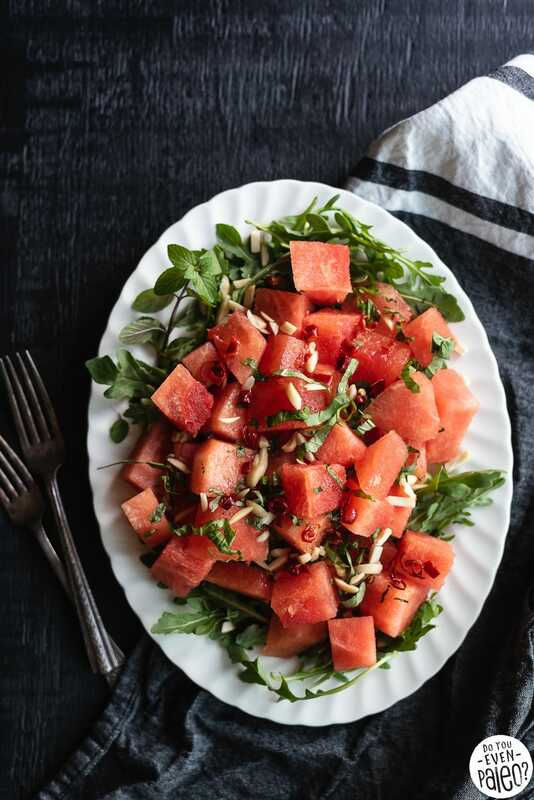 This watermelon arugula salad keeps things pretty simple. 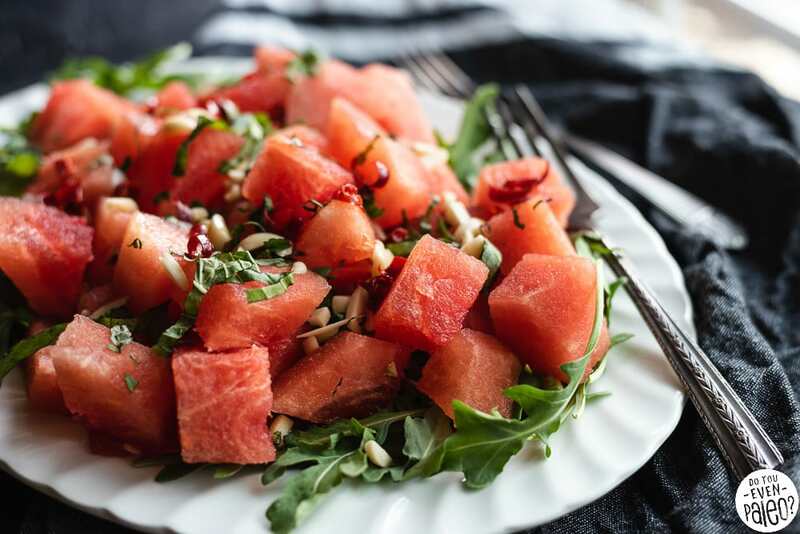 With those two ingredient, fresh herbs, and slivered almonds for some crunch, you’ve got the base of the salad ready to go. As for the dressing, it’s a basic blend of lime juice, extra virgin olive oil, honey, and sliced dried red chiles. Yeah, dried chiles. I use them quite a bit in my recipes, because they’re better-available than fresh chiles in my area and they’re way better than subbing spices. I keep a whole menagerie of different chiles on hand to kick up a sauce or boost the flavor of salsas. Trust me, they’re worthwhile to have around! But, I totally get if that’s a barrier for you. So feel free to sub in dried chile flakes. Now let’s get cooking, shall we? 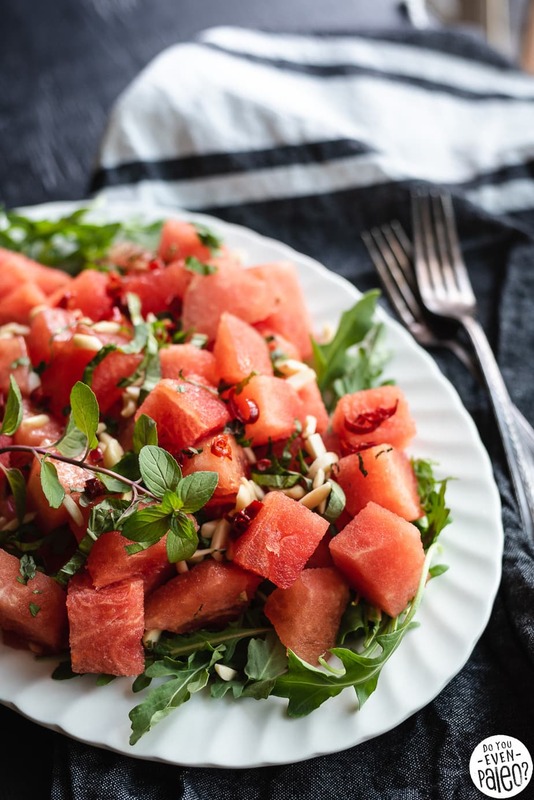 Simple gluten free and paleo watermelon arugula salad with fresh herbs, slivered almonds, and a chili honey lime dressing. 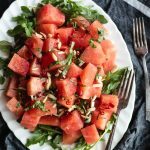 An easy salad recipe for summer! Place the dried chiles in a shallow bowl and cover with hot water. Let soak for 10 minutes to reconstitute. Once chiles have soaked, discard the water. Slice each chili open and remove the seeds. Slice into thin strips. Add the red chile, honey, lime juice, and extra virgin olive oil in a small bowl and whisk to combine. 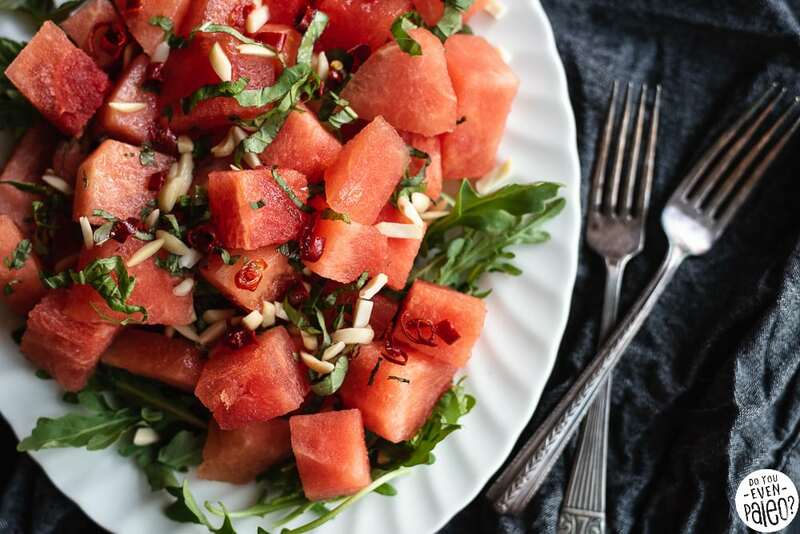 In a large bowl, add the cubed watermelon, arugula, basil, and mint. Drizzle with dressing and toss to combine. Garnish with almonds (they tend to sink to the bottom so I add them last). Best if served immediately. I used fairly generic dried red chiles for this recipe. If you have your hands on some dried arbol chiles (also small and red), start with only one – those suckers are spicy! Don't subscribe All Replies to my comments Notify me of followup comments via e-mail. 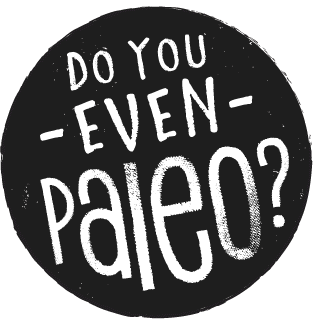 You can also <a href='https://www.doyouevenpaleo.net/comment-subscriptions/?srp=4999&srk=87505361eee98908ddf6ccb8681f50d6&sra=s&srsrc=f'>subscribe</a> without commenting.